Gone are the days of sacrificing top-tier beauty, precision, and price in order to gain the strength offered from full-contour Zirconia restorations. We’d like to introduce you to the future of highly aesthetic Zirconia bridges, The Zirkonzahn Prettau bridge. 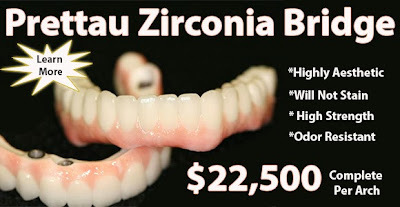 Prettau Zirconia is far more translucent than Zirconias of the past. Combine this with staining techniques applied by world class dental technicians, and you’ll see a bridge the likes of which were unimaginable in regards to strength and aesthetics. By eliminating veneered porcelain, you are not only sure to avoid chipping, but also eliminating wear on opposing teeth. Combining the Prettau bridge with our in-house milled provisionals allows for an even higher level of predictability for your final restoration. If you’re looking for strongest possible full arch restoration, without sacrificing the beauty you deserve, look no further than Golpa Dental Lab's Prettau Bridge. Upgrade you existing restoration for only $5,000. I am confident that when you compare the aesthetics of our new Prettau Zirconia Bridges, the decision to improve your smile will be an easy one! *Not all patients will qualify for the upgrade. Please allow 6 months of implant osseo-integration. Restrictions apply to life-time warranty. Replacement under warranty may incur incidental charges. Dr Golpa works with All on Four cases routinely with patients from all over the world.